Brazil is one of the most well-developed television broadcasting markets in the world, yet its film market has always lagged behind. “We have everything to be a new El Dorado, we can be the best in the world,” said Christina Castello, director of the first Feira Internacional da Industria do Cinema e Audiovisual (International Cinema and Audiovisual Industry Fair, or FIICAV). “The market is in a very productive moment.” But many of the experts who spoke at the gamut of seminars programmed for the three days of the FIICAV, which took place August 23 – 25 in Sao Paulo and served as a community gathering to discuss the state of cinema in Brazil, were not always so positive in their diagnosis. The survival of Brazilian filmmaking largely depends on government incentives, and politics inevitably enter into an already complicated debate about how to consolidate a market that is vulnerable yet full of potential. Discussion at the FIICAV centered on strategies for the future of their business, while recognizing that the Brazilian film industry needs opportunities for growth. Responding to the lack of any sort of public forum or market for film professionals, the FIICAV was created for industry leaders to share their experiences, learn from mistakes, and (more than anything) focus on filmmaking as a business. “We researched for two years, and there are a lot of festivals, screenings, award shows – events with a lot of glamor, but never with a business aspect,” Castello told indieWIRE. 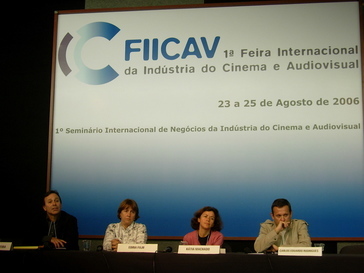 FIICAV panels included Fiscal-Incentive Marketing, Business Models for Independent Content, Film Commissions in Brazil and Latin America (among several others), but regardless of the subject, the discussion frequently returned to two fundamental problems: an industry fueled by incentives instead of competition, and theatrical distribution that is severely limited by a lack of screens. Unlike the incentive headache, the solution to the screen shortage seems fairly simple: Brazil needs more theaters. “Everyone knows that Brazil lacks screens,” said Fox Filmes executive Patricia Kamitsuyi during the Theater Distribution panel, and more theaters will be needed if theatrical distribution hopes to compete with the growing threats that new media and home entertainment represent to their business. Brazil is a large country comprised of several different regions, but 76% of its screens are concentrated in the south/southeast. Kamitsuyi observed that the cost of distribution is very high with Brazil’s size, unlike the rest of Latin America where the population is largely centered in the urban capitals. The release of an average film, which is what sustains the industry, needs all the regions to sell enough tickets, yet only a small proportion of the country has access to such films. Expressing the frustrations of her fellow panel members, Kamitsuyi summed up that “despite being the biggest market in Latin America, Brazilian distribution is still very focused in small movie theaters. We need modernization. Few films get the number of screens that we consider adequate.” The future may not be so bleak, however: 42 new multiplexes will be built throughout Brazil in the next three years, which will come as a relief to distributors. As for government programs that incentivize Brazilian cinema, the best strategy is decidedly more controversial. Filmmaking in Brazil is experiencing a renaissance after impeached president Fernando Collor de Melo pulled the plug on the government funding program in 1990, effectively killing all film production until a few dedicated producers slowly started getting their films made in the late 1990s. Brazilian production has been steadily re-establishing itself ever since this dark period, due largely to a law that allows companies to use a small percentage of their taxes to finance national films. Such tax incentives have been the lifeline for audiovisual production in Brazil, but the problem is that films funded by public money are not required to be released, let alone profitable. According to statistics published by Filme B, among the 42 Brazilian movies released from January to August, 2006, slightly more than half sold fewer than 10,000 tickets. (Only two have sold more than one million tickets and a third, “Zuzu Angel,” is expected to reach that level later this year.) Critics use such underwhelming results to point out that incentive laws, which artificially sustain an unprofitable industry, substitute the market and discourage filmmakers from learning how to be commercially responsible. Some FIICAV participants consider government incentives a failure that limit creativity, while others in the industry merely wonder how cinema can function as a self-sustaining business. Manoel Rangel, director of the Agencia Nacional do Cinema (known as ANCINE), defended his program at the FIICAV opening panel by stating that “all efforts, be they in regulation, promotion, or the economic development of the market are to maintain Brazil as a productive center of audiovisual content.” The market outside of Brazil was also a subject of interest at the FIICAV, as international co-productions were widely discussed as a model for financing. Producer Roberto D’Avila explained that the logic of international coproduction “is to combine finances and aggregate these countries’ markets,” but the challenge is “maintaining the film’s integrity” and “synchronizing the investments.” There is also the problem of language, which D’Avila said is fundamental in the international market and can make a difference of several million dollars at the box office. The fact that Brazil speaks Portuguese – and not Spanish – is a barrier to taking full advantage of the Latin American market (including the United States, where there is a built-in Spanish-speaking audience). D’Avila, along with a handful of others who spoke at the FIICAV, observed with some frustration and admiration that Argentina seems to be more successful in exporting its films abroad, despite the fact that its market is smaller than Brazil’s. The FIICAV excelled as a platform for considering the state of Brazilian cinema, though for an event in its first year it is hard to know how to measure its success – there were a lot of empty seats at the seminars, and only 2,850 people registered for the fair. (Far fewer than the 15,000 people per day predicted by the event organizers.) In addition to seminars, there were a handful of stands representing various companies in the field, as well as the modest MCA Cine & TV (Market of Audiovisual Content). “It’s very difficult creating a new fair. People are not very accustomed to displaying themselves in their country,” Castello said. “We don’t have this habit, the culture of displaying ourselves – people say, ‘display what? '” This year the FIICAV piggybacked on the tails of the much larger Broadcast & Cable Fair, which happened simultaneously, and for now it may need to depend on the success of its bigger brother. It may take awhile for Brazilian cinema to catch up with national television.